Lemont Farmers Market as a new market day begins, before "the evening rush". Photo via Lemont Farmers Market Facebook page. One of the more scenic and interesting communities in Central Pennsylvania is the quaint town of Lemont. Artsy, friendly, historic, and filled with beautiful old houses, it stands to reason that they would have a farmers market. It just makes sense. The Lemont Farmers Market is a relatively new market in our area, and it’s also one of the most picturesque ones. The market was founded in 2012 by the Lemont Village Association and is located at the John I. Thompson Grain Elevator and Coal Sheds, known to most in the area simply as The Granary. Built in 1885, The Granary was originally constructed for storing grain and for a place for trains to deposit coal. 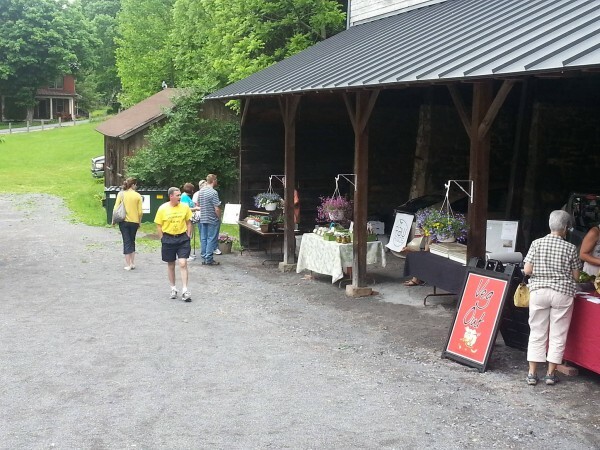 Today, the coal shed part of The Granary makes for a unique and beautiful location for a farmers market. “We have such a perfect site for a farmers market,” said Susan Smith, chair of Lemont Village Association board. Because it’s such a great location, Smith said, there was always talk of having a farmers market at The Granary, but Department of Agriculture regulations were much stricter and no one had time to deal with them. Then, in 2012, regulations were relaxed and the market was born. The market has grown in its four years and offers a variety of local products. Along with the location, Kochersperger said that the vendors are also a big reason to come to Lemont for the market. “We are a fairly small market, but I think each of our vendors bring something really specific to the market,” she said. Kochersperger gave some examples of unique vendors at the market. These include Veg Out, featuring seasonal vegetables; Brazilian Munchies, featuring ready-to-eat Brazilian food such as delicious empanadas; Garden Secrets, who she mentioned offers the best beer mustard she’s ever had; Bee Tree Berry Farm, featuring berries; Scenic View Farm, an Amish vendor offering vegetables, eggs, maple syrup, and raw honey; and Serendipity’s Cakes of Distinction, offering gluten-free baked goods, just to name a few. She also is a vendor herself for the company she co-owns, Rothrock Botanicals, selling natural and herbal body products such as scrubs, masques, aftershave, beard oil, and mustache wax. 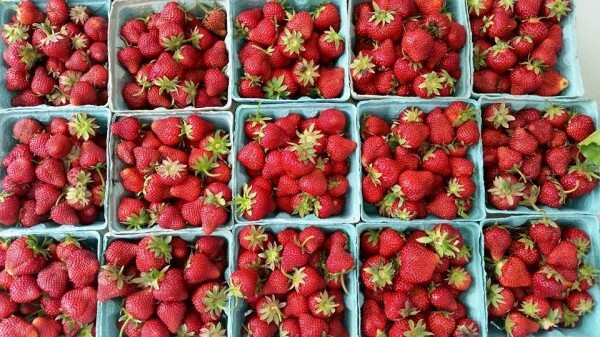 Fresh strawberries are now available at the market. Photo via Lemont Farmers Market Facebook page. “Not only is the food better tasting and for us, it is made by people we love,” Kochersperger added. The friendliness and sense of community at the farmers market fits in well with overall feel of Lemont, Smith said. “You feel safer in a community if you know your neighbors, and visiting the market is a way to know your neighbors and discover that Lemont is a great place to live,” Smith added. To learn more about the market, including how to become a vendor, please go to the Lemont Village Association’s website. 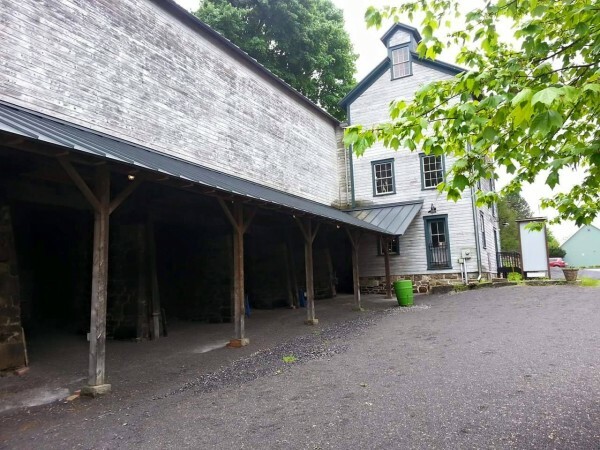 The Granary and Coal Sheds reflect Centre County’s history and provide a bucolic setting for the market.